Mixed Martial Arts (MMA) is currently the fastest growing sport and martial art in the world. MMA is a combination of Brazilian Jiu Jitsu, Wrestling, Muay Thai, Boxing, and more. The core of our regular MMA program is aggressive, technical striking, Jiu JItsu, takedowns, striking, and ground striking. Derived from the Japanese martial arts of Kodokan Judo and Jujutso, Brazilian Jiu Jitsu is commonly referred to as ‘the gentle art. Jiu Jitsu is a system of ground fighting that relies on grappling, chokes and joint locks to overpower and opponent. Jiu Jitsu allows a smaller, weaker opponent to overcome a larger aggressor using technique and strategy. The national sport of Thailand, Muay Thai is widely considered the most superior striking art. Often referred to as “the art of eight limbs” or “the science of eight limbs”, Muay Thai utilizes the fists, elbows, knees, shins and feet, thus using eight striking points. Wrestling is a form of combat sport involving grappling type techniques such as clinch fighting, throws and takedowns, joint locks, pins and other grappling holds. A wrestling bout is a physical competition, between two competitors or sparring partners, who attempt to gain and maintain a superior position. There are a wide range of styles with varying rules with both traditional historic and modern styles. Wresting has steadily risen in popularity as many decorated wrestlers continue to transition to mixed martial arts. 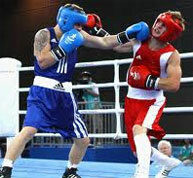 Boxing involves two participants of similar weight, duking it out with only their fists. Boxing has evolved to include numerous styles from all over the world. Boxers have a variety of different fighting styles, stances, defenses and punches. The techniques learned in boxing are often at the core of many fighters’ training. Our kickboxing classes begins with a five- to 10-minute warm-up that involves large muscle movements to increase blood flow and heat up the muscles. The main portion of the class involves combinations of punches and kicks that are repeated multiple times to ensure mastery. Class concludes with a three- to five-minute cool-down that involves static stretching of the hips, shoulders, and core. Wrestling is a sport that will help develop agility, coordination, flexibility, balance, self-esteem, self-discipline, and a strong work ethic. Designed for boys and girls 6-16 yrs old, our program will provide fundamental skills for beginners and advanced skills and drill for advanced students.